This Bosch Tankless is a high performance, fully condensing system available from Bosch within the Greater Toronto Area. A condensing tankless captures heat from the exhaust gases and uses it to preheat the incoming cold water through the use of a secondary heat exchanger. This nets around a 12% efficiency increase further reducing emissions. The Bosch Therm tankless is a great system to be used in conjunction with a solar thermal application. Toronto and surrounding areas are very well suited for solar thermal applications. Even in winter you would be surprised as to how hot solar energy is able to preheat incoming water temperatures. The preheated water is then assessed by the Bosch tankless and sufficient energy is then used to further heat the water to your desired temperature. Bosch also utilizes an exclusive burner design which they have patented. Their system utilizes a modulating vertical burner that prevents hot spots reducing the chance of a heat exchanger crack. The even burn associated with this design also reduces the buildup of scale and deposits within the heat exchanger. 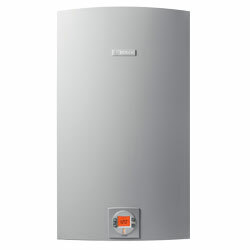 Scale can significantly reduce the efficiency of both a tankless and a conventional water heater.